Objective: The aim of the study was to determine the risk factors, prevalance, epidemiological parameters and maternal-perinatal outcome in pregnant women with hypertensive disorder. Materials and methods: A retrospective analysis was undertaken on 255 consecutive cases of hypertensive disorder in pregnancy who were managed at Kocaeli University, School of Medicine, Department of Obstetrics and Gynecology from June 1997 to November 2004. Demographic data involving age, parity, gestational week, clinical and laboratory findings were recorded from the medical files. Additionally delivery route, indications of cesarean section, fetal and maternal complications were determined. Statistical analysis was performed by SPSS programme using Kruskal Wallis nonparametric test, ANOVA (Analysis of variance) and chi-square tests. Results: Of 5,155 deliveries in our clinic during the defined period, 438 cases (8.49%) were managed as hypertensive disorder of pregnancy. Medical records of 255 cases could be avaliable. Of 255 cases, 138 patients (54.11%) were found to have severe preeclampsia while 88 cases (34.50%) were diagnosed as mild preeclampsia. Twenty-nine patients (11.37%) were suffering from chronic hypertension. Of 138 severely preeclamptic cases, 28 cases (11%) had eclamptic convulsion and another 28 patients (11%) were demonstrated to have HELLP syndrome. 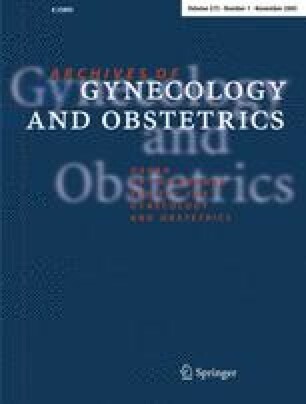 Intrauterine growth restriction, oligohydramnios, placental ablation were the obstetric complications in 75 (29.4%), 49 (19.2%), 19 (7.5%) cases, respectively. Additionally multiple pregnancy and gestational diabetes mellitus were noted in 5.9% (n:15) and 3.9% (n:10) of the patients. Delivery route was vaginal in 105 patients (41.2%) while 150 patients (58.8%) underwent cesarean section with the most frequent indication to be fetal distress in 69 cases (46%). Cesarean section rate seemed to be the lowest (48.3%) in chronic hypertensive women while the highest (63.8%) in severe preeclamptic patients. Maternal mortality occured in 3 cases (1.2%) and all of those cases were complicated with HELLP syndrome. Intracranial bleeding was the cause of maternal death in one case while the other two cases were lost due to acute renal failure and disseminated intravascular coagulation, respectively. Intrauterine fetal demise was recorded in 24 cases on admission. Ten fetuses died during the intrapartum period. Mean gestational age and birth weight were 28±3.5 and 1000±416 g, respectively in this group. In these ten women, five cases were diagnosed as HELLP syndrome, two were severely preeclamptic and three were eclamptic. Perinatal mortality rate was found to be 144/1,000 births Conclusion: Hypertensive disorder of pregnancy is associated with increased risk of maternal-perinatal adverse outcome. The complications of severe preeclampsia and eclampsia could be prevented by more widespread use of prenatal care, education of primary medical care personnel, prompt diagnosis of high-risk patients and timely referral to tertiary medical centers.